Why didn't you tell me about the vertigo? I would have been over there helping out! Quit trying to be superwoman and call your mom. There is an exercise that can be done with your head which will often resolve this. As your doctor to send you to a physical therapist who is familiar with this and have it done. It is usually quite successful. No fun!! I hate getting vertigo. I used to get it when my candida was acting up. There is so much going around right now that maybe you caught a bug of some sort. I would love to win these for a friend who collects owls. They are adorable. These are adorable! I love how you posed them. I'm so sorry you've had to deal with Vertigo!!.. Ugh that must be so frustrating. The owls are absolutely adorable. I have a small collectin of owls that you've probably seen here and there on my blog... would love these on my kitchen window sill. Yes, I have recently had a concerning bout with dizzy - serious dizzy. My chiropractor assisted, and gave me an understanding of the mechanics of the event - armed with some information lessened the concern. I did obtain some inexpensive - over the counter medication - (I don't like to take stuff - so i didn't - but i have it - in case) - I improved - it has tried to visit a couple of times since - But, i find I'm okay . . . SO, I'm believing YOU - Amazing YOU who shares great things with us on her blog - and creates fun, cute stuff - and includes all of us in the best things . . I Believe YOU are going to be "A-Okay" - and this Dizzy Thing (which works great in a song - but not so good in real day-to-day life) - Is gonna find a better place to hang - and vacate your world. You know I have a problem with all things owl. 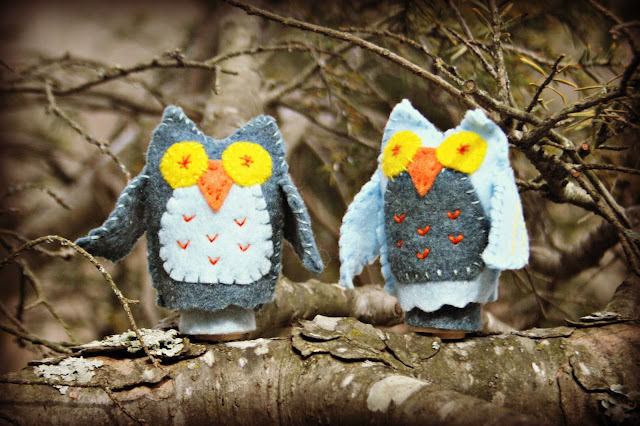 I could be spending all my spare time crafting OWLS! Cute! I've been seeing all these owls on pinterest made out of card board toilet paper rolls. They are on my to do list if I'm feeling crafty. I hope you are up and about soon. I always thought vertigo was a condition like claustrophobia! Weird. sorry to hear about the vertigo! has got to make life almost impossible! One of my students Kimmy! I'm sorry about the vertigo. I have had one really bad spell, and it was miserable. Hope you feel better soon! The owls are so cute! I love owls anyway. Cute, but you must be going out of your mind! You don't seem like a sit around and craft kind of gal to me.. I'm sorry about the vertigo. I'm pretty much a baby when I even get a minor dizzy spell. I hope this one passes soon! So sorry to hear about your vertigo. My co-worker had that from time to time and once I had to bring my mother to the ER with it. Hope you get back to running soon! These are just wonderful! But these raffle thingie boxes confuse me, I hope I have some entries! YES, I have BPV, that is what Benign Positional Vertigo is called. I got it when I was your age, too. I even went up to Charlottesville to UVA to see an expert there. Mine can get so bad that things even spin with my eyes closed!!! Do you ever take ibuprofin? Sometimes that can cause it , but that is a very rare side effect. If you keep getting it, there is a technique...there are usually small crystals that get lodged in your inner ear and you kind of hang your head upside down and do certain motions.I am so sorry for you, it is just miserable! The first time I got it, our son was a toddler. I literally had to crawl on the floor to get anywhere! So sorry to hear that you've got vertigo, hope you will feel better soon. I know what you mean not being able to run or anything. I'm sorry about your vertigo. I've never had that problem --but I can imagine how hard it would be to try to do normal things with it. Oh Lisa...I am so sorry to hear of your vertigo. It must be awful! I do LOVE your owls though! They are so cute! Crossing my fingers to win them for....ME! hehe! The owls look great! Sorry to hear about the vertigo though. I went through a bout with that some years back. Saw a substitute doctor who said I was a dizzy blonde! Anyway, it turned out I had an inner ear infection. Get well soon! I hope your vertigo goes away FAST! And I hope it won't mess your job up! How cute! Hope you are better soon! I sure hope you start feeling better. I can't imagine how bad it would be to have to stay still so long. I would love to win them for my grandchildren. I love the colors and stiching. They are adorable. Cute owls! I'm so sorry to hear about the vertigo. I've experienced it and it's awful! My usually last about 12 to 15 hours and goes away. Hope you get better soon! I have vertigo, Lisa. Not fun. I can't even open my eyes or walk around when it hits me hard. I had a slight issue yesterday outside - a plane flew over and when I looked up to see it - bam! Down on the ground I went. I have an underlying condition that has caused me to have vertigo. I feel for ya! I love the owls, very cute!!! So sorry about the vertigo. My mom has had issues with that as well and from what she says it is horrible! These are adorable Lisa -- your hand-stitching is perfect! Hey, that's pretty darn good for having vertigo! They are adorable! I'd love these because they're just "my" look. I love owls, and these are adorable! Thank you so much for the contest :)I'd love for them to fly here to my Midwest kitchen window. I would love to win this cute prize for myself because I really love owls! They look so cute and wisdom, I think! I have twin 6yo girls who are huge owl fans. They'd love them! I want these for me! LOL! I would like to win these for my lil guy! I would like to win these for my baby grand-daughter, they are adorable like she is. I'm sorry you have Vertigo, I get it myself once in awhile and it is not fun. I find limiting salt intake at night time and deep breathing helps. I would love to win these for my 2 year old nature lover Sylvia! I'd like to win these for our family. I am sending all good wishes that you are feeling much better very soon! My mom would LOVE these. My son would love them!! I would love to have them for me! These are so cute. I would love to win for myself.